Used in industrial, educational, healthcare and the most arduous of environments. 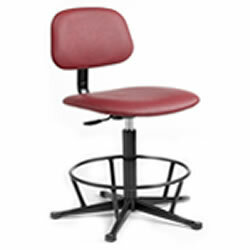 Cushoined hardwearing upholstered seat and back rest. or Black, Blue, Gree, Port Red vinyl. Supplied with glides or castors.